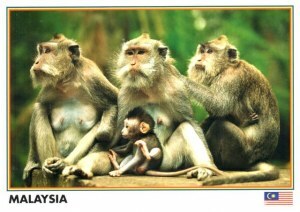 The macaques constitute a genus (Macaca) of Old World monkeys of the subfamilyCercopithecinae. The twenty-two species of macaques are widespread over Earth. Macaques are of some interest to human researchers for their intricate social structures and their usefulness in animal testing, particularly regarding eyesight.